A short sale happens when a homeowner owes more on his mortgage than his home is worth in today's fair market value. Therefore, the home is underwater, or upside down. A homeowner's real estate agent then negotiates with the owner's bank to accept less than the balance of the mortgage. For example, if a home is only worth $400,000 but the owner has a mortgage balance of $500,000, then he will be $100,000 "short" when he goes to sell his home. In order to qualify for a short sale, you must show that you are experiencing some kind of financial hardship. For example, if your income has dramatically dropped, or you have lost your job, or you are a few payments late on your mortgage and having trouble keeping up. In other words, if you're on a steady road to foreclosure, then you are very likely a perfect candidate for a short sale. Also, the home must be worth less than the balance of your mortgage. The first step in pursuing a short sale is speaking with a knowledgable short sale agent who can run a home evaluation of your property and determine if you qualify for a short sale. Next, your home will be marketed for sale, and buyers will present you and your agent with offers. You will accept the highest offer and your agent will submit that offer, along with your short sale application to your lender. The process can take anywhere from 1-4 months, depending on your lender. In many cases, you can complete a short sale with little or no cost out of pocket. This is why it's so important that you work with a short sale specialist, and not just any agent you know. There are so many benefits to doing a short sale compared to the alternative of being foreclosed on. For starters, when you go through a successful short sale, your credit is only affected for around two years. That means you can rent for a couple of years and then you can buy another home and you're right back to homeownership. If you are foreclosed on, that hits your credit very hard for around seven years! Also, many banks are now offering homeowners move out financial assistance to cooperate with the short sale, which means they will sometimes pay you to move. Don't expect that kind of treatment with a foreclosure proceeding. Since every situation is different, we recommend you speak to a short sale specialist that works your market area. Every state has different rules and tax implications. 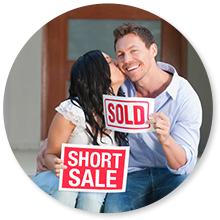 Consult short sale specialist to see if a short sale is right for you.